September 1, 2017. 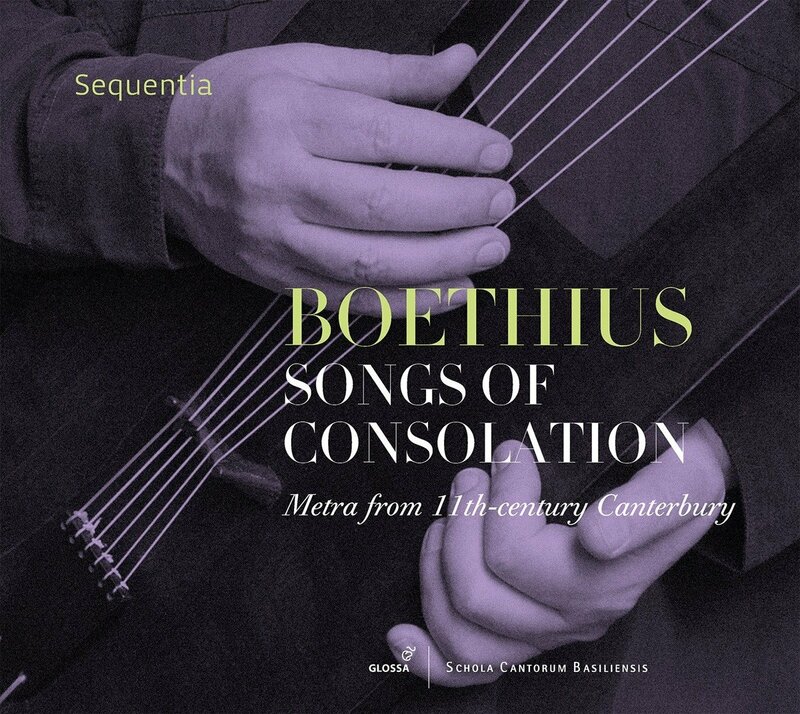 To quote their own website, http://www.sequentia.org/, Sequentia, founded in 1977 by Benjamin Bagby and the much-lamented Barbara Thornton (1950-1998) , “is one of the world’s most respected and innovative ensembles for medieval music. 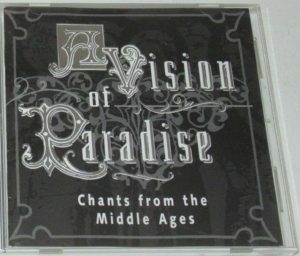 It is an international group of singers and instrumentalists (…) dedicated to the performance and recording of Western European music from the period before 1300. 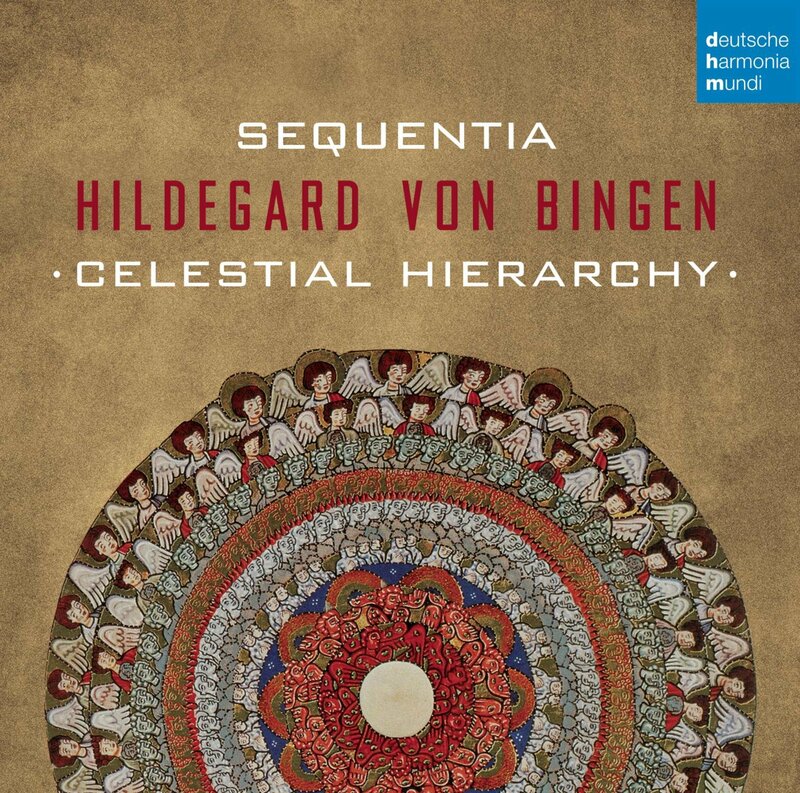 The size and disposition of the ensemble is determined by the repertoire being performed, and ranges between an instrumental/vocal duo to a large vocal ensemble. 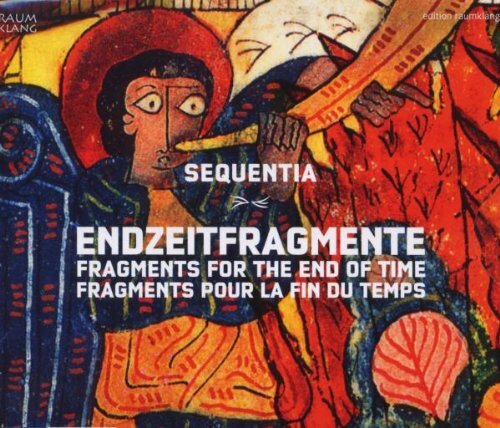 Based on meticulous and original research, intensive rehearsal and long gestation, Sequentia’s virtuosic performances are compelling , surprising in their immediacy, and strike the listener with a timeless emotional connection to our own past musical cultures”. 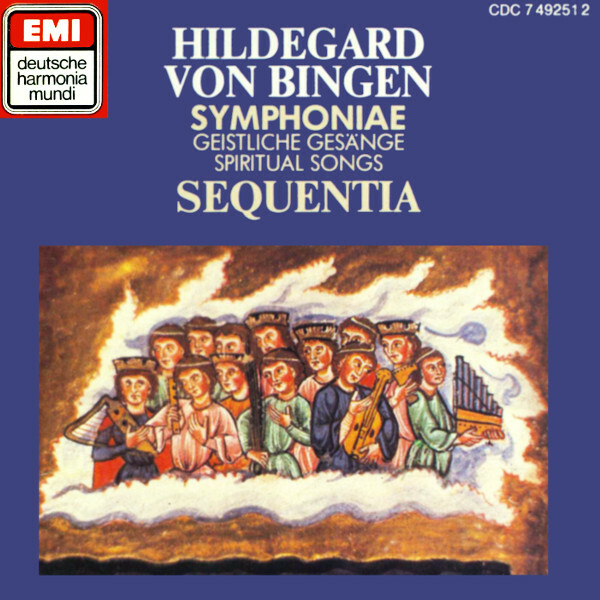 To this I’ll add that, starting with their recording of Ordo Virtutum in 1982 – only their second recording – followed by seven more (including a remake in 1998), they were essential in the rediscovery of the music of Hildegard von Bingen, and that the music they perform, or (and) the way they perform it, is sublime, an adumbration of an otherworldly, eternal bliss. 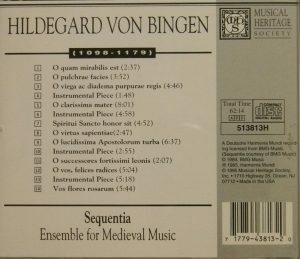 I am much indebted to the discography of the regretted Pierre F. Roberge on Medieval.org (in general THE essential resource on Medieval music discography), but I’ve filled a few gaps, added some minutiae about the intricacies of BMG’s American vs European editions, indicated the chronology of release of each edition and provided the barcodes to make the CDs easy to find on your usual commercial website. 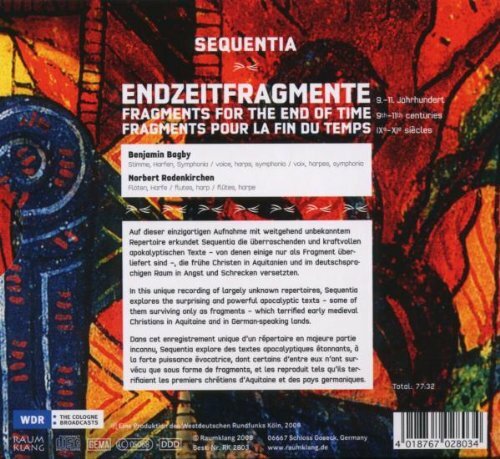 Sequentia’s website also includes a complete discography, from which I’ve gleaned useful information, but it is less informative than Roberge’s discography. 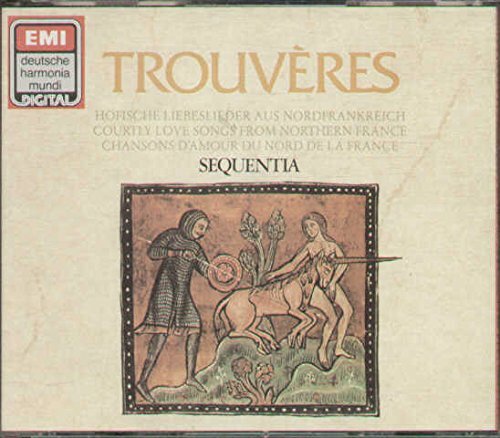 There’s also another fine website for medieval music with great resources on Sequentia’s discography, Sonusantiqua.org, and they’ve given me access to the cover photos of some of the original CD releases when they were missing on the customary commercial websites. The discography is organized by chronological order of recording (publications were sometimes delayed – in one case, if my information is correct, by as much as ten years -, copyright year is given in parantheses). 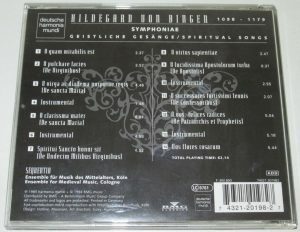 Label is Deutsche Harmonia Mundi unless otherwise indicated. Label numbering and barcoding of DHM changes over time because it was distributed by or became part of different organizations, first EMI (CDC and CMS label numbering), then BMG (GD77XXX for the European editions and 77XXX-2-RC or RD the US editions, then a unified 05472 77XXX 2), then Sony. I have listed the licensed editions from The Musical Heritage Society and the Japanese editions when I have found them, but have not systematically looked for them, so I very well may be missing some. I list the compilations and collections at the end. 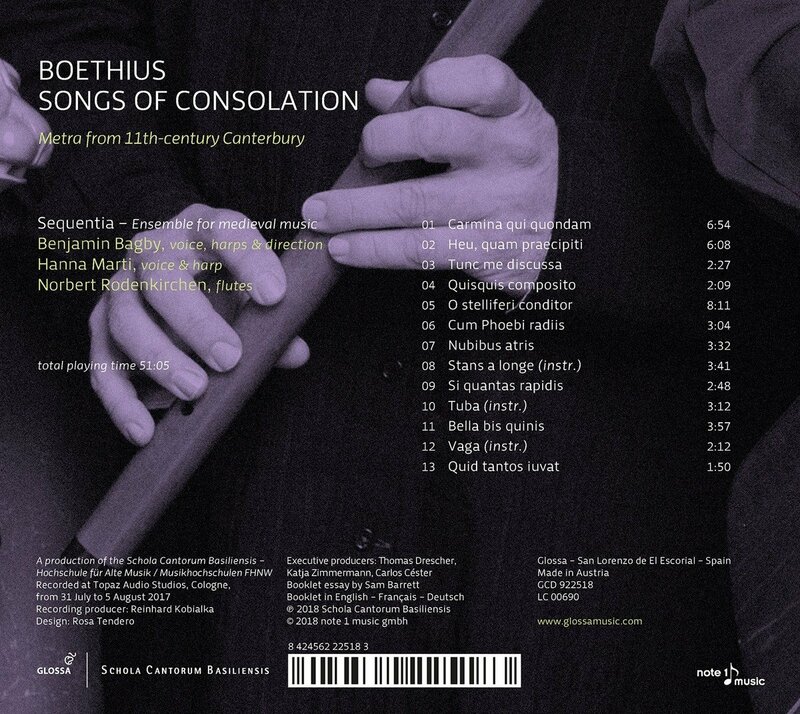 I’ve updated this list on November 29, 2018 to add Sequentia’s latest album, “Boethius Songs of consolation”, as well as some cover photos. The titles linked are those I’ve reviewed. 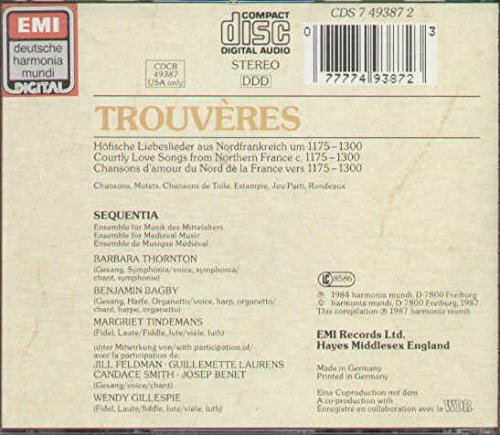 from LP 1C 165-99 942/43 T (1982), Harmonia Mundi HM 20 395/96 (1982). from LP 1C 069 1999941 (1983) For cover photos see Sonusantiqua.org. 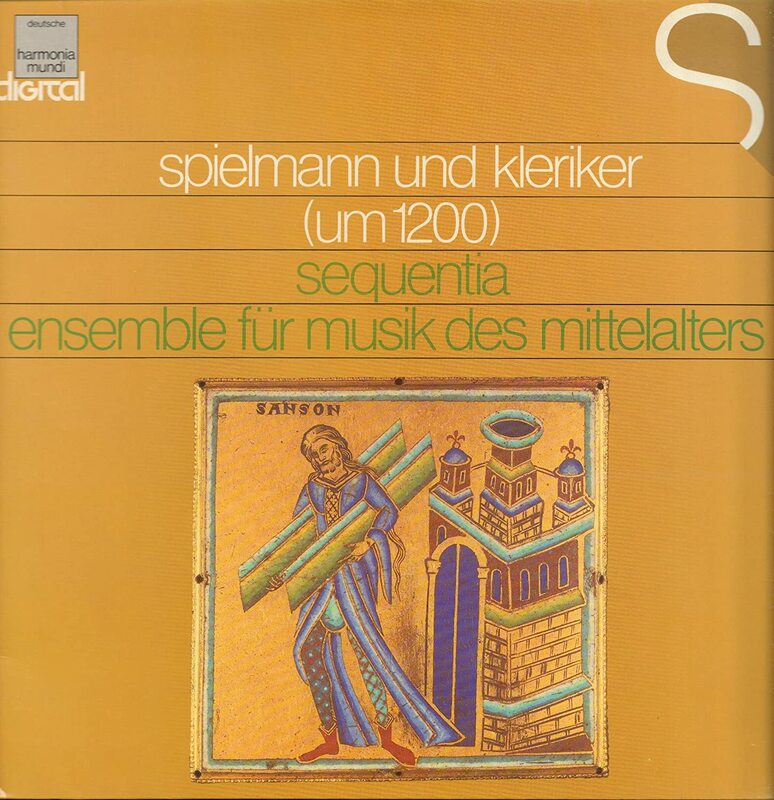 Also issued on Deutsche Harmonia Mundi HM 745 “Musica Medicina – Symphonialis Est Anima” (1985), in cooperation with ICI-Pharma Heidelberg, part of a series on “Kunst und Krankheit” (Art and Illness). 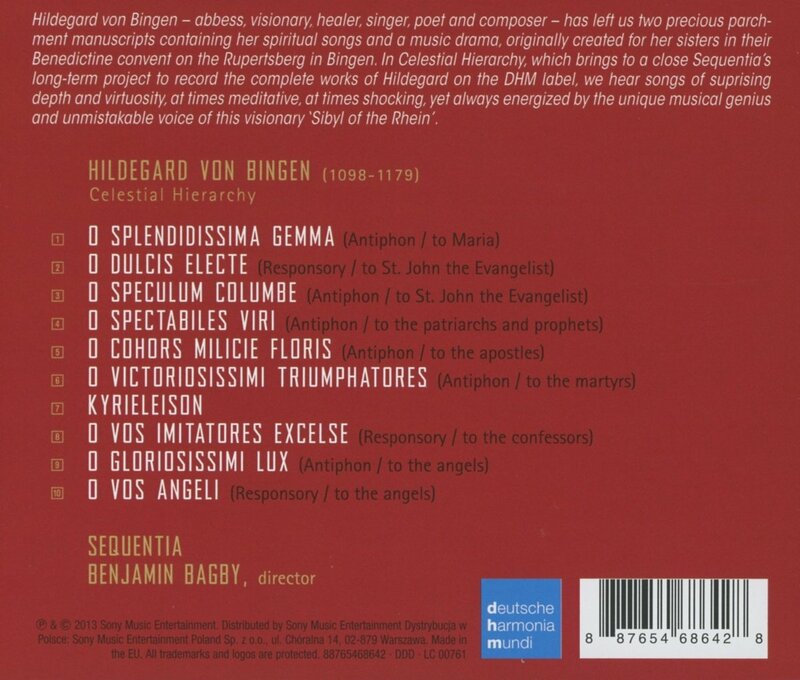 82876 58939 2 (SACD) Lost Songs of a Rhineland Harper X & XI Century. Rec. 9/02 (2004) bc 828765893923. Also 82876 58940 2 (SACD) (2004), bc 828765894029. 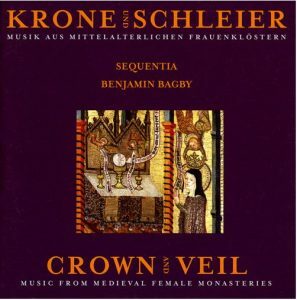 (from Sequentia’s website:) Sequentia’s ensemble of female vocalists, directed by Benjamin Bagby and joined by the members of the young ensemble Ars Choralis Coeln, presents masterpieces of liturgical and devotional music from medieval German convents, including some pieces performed here for the first time since the Middle Ages. This anthology was produced to accompany the major exhibition ‘Krone und Schleier’ presented by the Kunst- und Ausstellungshalle der Bundesrepublik Deutschland (Bonn) and the Ruhrlandmuseum Essen in the Spring of 2005. 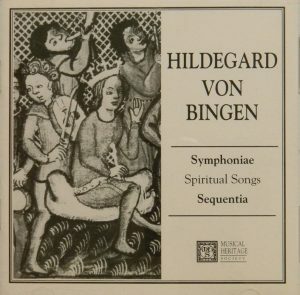 It was produced by the West German Radio and sold only through the museums. 12. Ordo Virtutum: Que es aut unde venis? Comes in the form of a book with leather binding and includes lavish booklet. Great gift for Christmas!